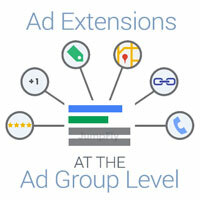 There is no question that ad extensions are critical to the success of any search campaign. Extensions provide additional information about a product or service, capture more real estate on the search engine results page, and set your ad apart from the competition. All too often Google AdWords and Bing Ads PPC accounts include one set of extensions across the entire account and miss the opportunity to get creative with site links, call outs, and structured snippets. Creating these extensions at the ad group level will further tailor your message to the search query and make your ad even more relevant! Site Link extensions (available on Google AdWords and Bing Ads) offer additional links for customers to click on. While the more general “Contact Us”, “Directions”, and “About Us” site links are necessary to include in the account, more specific ad groups may benefit from the use of tailored site links. For example, an ad group designated to blue sweatshirts could include site links to Men’s, Women’s, and Youth Blue Sweatshirts. Offering these extra links related to the search query could give the searcher more options to find a more relevant page. Call Out extensions (available on Google AdWords and coming to Bing Ads sometime in 2016) provide an additional line of text and are a great way to reach your customers. Let’s revisit the blue sweatshirts example. While the account may be using more general call outs like “Satisfaction Guaranteed” and “Free Shipping”, we can get more specific for the blue sweatshirts ad group. “10% Off Blue Sweatshirts”, “15 Different Shades” and “Super Soft & Durable” will give the customer more information about the specific product and may make them more likely to click on your ad. Structured snippets (available on Google AdWords) are currently only available in a few headings. If applicable to the business, this extension can allow an additional line or two of text to show with your ad. Account wide, you can use a snippet similar to “Types: Sweatshirts, T-shirts, Jackets, Long Sleeve Tops”. However at the ad group level, an ad for blue sweatshirts will not make much sense with such a general snippet. Instead, “Types: Hoodies, Pullovers, Crewnecks, Zip-Ups” would be more relevant to the search query and would increase the effectiveness of your ad. Image extensions (available on Bing Ads) are a new way to add a visual component to your ads. Showing an image of a blue sweatshirt next to your text ad can really attract attention. Using site link extensions, call out extensions and structured snippets creatively can increase the impact of your extensions strategy by making your ads more specific to search queries and increasing the relevancy of your ads. Get the most out of this extra space on the SERP and continue setting yourself apart from your competitors!